This third production in the Donmar Warehouse’s all-female Shakespeare trilogy is the one where, in many ways, the women’s prison setting makes the most sense. The Tempest, after all, is a play of exile and isolation set in a land where different rules apply and children are separated from their parents. 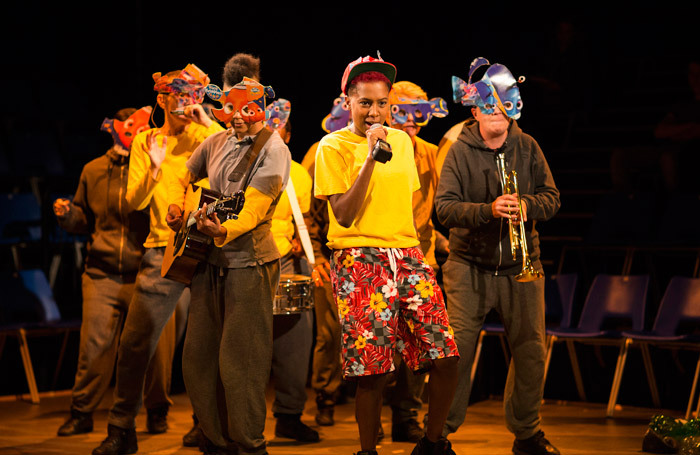 Phyllida Lloyd’s three productions, re-mounted at the King’s Cross Theatre in the round, the playing space marked out like a prison gymnasium, are in part of the result of a creative partnership with Clean Break – the pioneering theatre company that makes work based on women’s experiences of the prison system – and that influence feels most in evidence here. At the same time, of all the three it’s the least theatrically satisfying, a little bitty and fitful in comparison. But while it lacks of the propulsion of Julius Caesar and Henry IV, it features a commanding central performance from Harriet Walter. She exudes a quiet power as Prospero, watchful, weary, her eyes glistening at the prospect of losing her daughter. You can see the torment etched upon her face. Leah Harvey, making her professional debut as Miranda, is wonderfully sunny and her scenes with Sheila Atim’s Ferdinand are a delight. Jade Anouka makes an eager Ariel, a sweet-voiced spirit with an edge of sadness to her. While it might be the least cohesive of the three, as the culmination of a project that explores how Shakespeare is played and by whom, that populates the stage with fascinating, complex women and then allows those women to take up space and make noise, it is still a production of power and a source of joy.